Umbilical Venous Catheterization (UVC) is a common practice in neonatal units, though not without risks. Complications may occur in over 20% of patients; however pleural effusion is extremely rare. We report a case of an extreme preterm male neonate weighing 810 g, who developed pleural effusion due to malpositioned UVC. Pleural fluid was biochemically similar to parenteral nutrition solution. This alongside with the absence of recurrence of pleural effusion after UVC removal, support the causality between the UVC and pleural effusion. This case emphasizes the need to confirm the correct positioning of UVC. When in doubtful position, it should be withdrawn as early as possible, ensuring an alternative central access. If the clinical situation does not allow it, it is important to consider the osmolarity of the perfused solution, due to the risk of endothelial damage. Umbilical Venous Catheterization (UVC), first described in 1947 by Diamond , is a common practice in most neonatal units. It provides a quick and easy access to the systemic circulation, allowing a wide variety of purposes and preventing multiple painful venipunctures. However, this procedure is associated with significant complications [2,3]. Mechanical complications may occur in over 20% of patients, especially if malpositioned . Pleural effusion is rarely reported as a complication of UVC . We report a case of an extreme low birth weight preterm male neonate (810 g, 25 weeks of gestation), delivered by spontaneous vaginal delivery due to cervical incompetence. The APGAR score at first, fifth and tenth minute was 3, 5 and 7, respectively. He was intubated and ventilated at delivery room and initial physical assessment was unremarkable. Upon admission to the Neonatal Intensive Care Unit (NICU), the neonate was accidentally extubated and reintubated, then starting progressive worsening respiratory distress. Right pneumothorax was diagnosed and chest tube placed. Its correct position was confirmed by chest radiograph. The newborn was placed on high frequency oscillatory ventilation and chest drainage active suction, according to the NICU protocol. The umbilical catheters were introduced and the location of catheters tip was verified by anteroposterior chest radiograph. Umbilical Arterial Catheter (UAC) was placed at a low position and was removed after a few hours, due to vasospasm of the left lower limb. UVC tip was malpositioned at the left upper abdominal quadrant and therefore was withdrawn 1.5 cm. Parenteral nutrition was then initiated, on the first hour of life. Ampicilin and gentamycin were started as empirical treatment. During the first day, blood gases were appropriate (pH 7.35, pCO2 35.5 mmHg) and the minimum blood glucose level was 85 mg/dL. At 24 h of life, the neonate became hypotensive and oligoanuric refractory to therapy (saline bolus, inotropic drugs and hydrocortisone) in association with worsening respiratory function, persistent hypoxemia, metabolic acidosis and blood glucose level of 47 mg/dL. The chest radiograph showed recurrence of the right pneumothorax, due to chest tube malposition (Figure 1). The chest tube was replaced, with an initial drainage of air and serohematic fluid that turned into milky/yellowish (Figure 2), in a total of 164 ml. Cytochemical examination of pleural fluid revealed a predominance of polymorphonuclear cells and a high glucose concentration (1173 mg/dL) that is compatible with parenteral nutrition solution. Peripherally inserted central catheter was placed and UVC removed. After catheter removal, mean arterial pressure, urine output and blood glucose normalized and there was no recurrence of pleural effusion. Chest tube was removed on the fourth day and post-procedure chest radiograph showed clear parenchymal lung fields. Blood culture was sterile, therefore antibiotics were stopped at day 5. The infant remained intubated for 40 days and received parenteral nutrition for 42 days. He was discharged without oxygen at 77th day of life. Brain ultrasound at discharge was normal. The high glucose concentration in the pleural fluid as well as the absence of recurrence of pleural effusion after catheter removal, support a causal relationship between the UVC and the pleural effusion. A possible mechanism could have been endothelial damage of a small vessel due to hyperosmolarity of parenteral nutrition solution (around 900 mOsm/L), as previously suggested by Traen et al., . The fluid have leaked into the abdominal cavity and crossed the diaphragm openings to the thoracic cavity due to active suction of chest drainage. This explanation supports the late presentation of symptoms. Correct positioning of the UVC is critical in order to prevent life-threatening complications . The optimal position of the UVC tip is considered to be just above the diaphragm in the thoracic inferior vena cava or at the cavoatrial junction. The current standard technique used worldwide to localize the catheter tip is Anteroposterior (AP) chest radiography, since it was introduced by Peck and Lowman in 1967 . However, cases have been reported suggesting that complications could occur even when AP chest radiographs revealed a proper position of catheter’s tip [7,8]. Lateral views increase the accuracy of chest radiograph in predicting the location of UVC tip, but it results on greater exposure of neonate to radiation . Recently, studies have demonstrated that echocardiography is superior to AP chest radiographs for UVC tip localization [2,10]. We should not forget to check the catheter’s tip location after any repositioning, and re-evaluate it regularly is mandatory. When malpositioned or in doubtful position, catheters should be withdrawn as early as possible, ensuring an alternative access. If the clinical situation does not allow it, it is important to consider the osmolarity of the perfused solutions, due to the risk of endothelial damage. Sara Machado Rocha: Concepted, designed, drafted and revised the manuscript. Catarina M Lacerda: Reviewed and revised the manuscript. Margarida Rosal, Carla David and Teresa Tomé: Served as scientific advisors and critically reviewed the manuscript. Diamond LK (1947) Erythroblastosis foetalis or haemolytic disease of the newborn. Proc R Soc Med 40: 546-550. Pulickal AS, Charlagorla PK, Tume SC, Chhabra M, Narula P, et al. (2013) Superiority of targeted neonatal echocardiography for umbilical venous catheter tip localization: Accuracy of a clinician performance model. J Perinatol 33: 950-953. Hoellering AB, Koorts PJ, Cartwright DW, Davies MW (2014) Determination of umbilical venous catheter tip position with radiograph. Pediatr Crit Care Med 15: 56-61. Lloreda-García JM, Lorente-Nicolás A, Bermejo-Costa F, Fernández-Fructuoso JR (2016) Complicaciones mecánicas asociadas a la localización de la punta de catéteres centrales en una unidad neonatal. Anales de Pediatría 85: 77-85. Traen M, Schepens E, Laroche S, van Overmeire B (2005) Cardiac tamponade and pericardial effusion due to venous umbilical catheterization. Acta Paediatr 94: 626-628. Peck DR, Lowman RM (1967) Roentgen aspects of umbilical vascular catheterization in the newborn. The problem of catheter placement. Radiology 89: 874-877. Unal S, Arifoglu I, Celik IH, Yilmaz O, Bas AY, et al. (2017) Pleural and pericardiac effusion as a complication of properly placed umbilical venous catheter. J Neonatal Surg 6: 34. Pabalan M, Wynn RJ, Reynolds AM, Ryan RM, Youssfi M, et al. (2007) Pleural effusion with parenteral nutrition solution: An unusual complication of an “appropriately” placed umbilical venous catheter. Am J Perinatol 24: 581-586. Guimarães AF, Souza AA, Bouzada MC, Meira ZM (2017) Accuracy of chest radiography for positioning of the umbilical venous catheter. J Pediatr (Rio J) 93: 172-178. Fleming SE, Kim JH (2011) Ultrasound-guided umbilical catheter insertion in neonates. J Perinatol 31: 344-349. 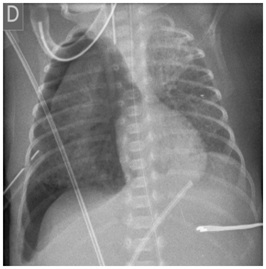 Figure 1: Recurrence of right pneumothorax due to chest tube malposition; UVC tip malpositioned at the left upper abdominal quadrant. Figure 2: Milky yellowish pleural liquid, corresponding to parenteral nutrition solution. Citation: Rocha SM, Lacerda CM, Rosal M, David C, Tomé T (2018) Pleural Effusion as a Complication of Umbilical Venous Catheter. J Neonatol Clin Pediatr 5: 026. Copyright: © 2018 Rocha SM, et al. This is an open-access article distributed under the terms of the Creative Commons Attribution License, which permits unrestricted use, distribution, and reproduction in any medium, provided the original author and source are credited.